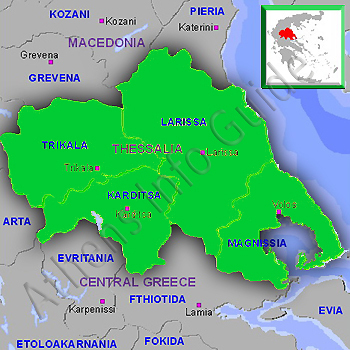 Thessaly (Thessalía) is one of the 13 regions of Greece. It is sub-divided into 4 prefectures. The capital is Larissa. Together with the regions of Macedonia and Thrace, it is often referred to unofficially as Northern Greece. Thessaly lies in central Greece and borders with Macedonia to the north, Epirus to the west, Sterea Hellas or Central Greece to the south and the Aegean Sea to the east. Before the Greek Dark Ages, Thessaly was known as Aeolia. Thessaly was home to an extensive Neolithic culture around 2500 BC. Mycenaean settlements have also been discovered, for example at the sites of Iolcos, Dimini and Sesklo (near Volos).